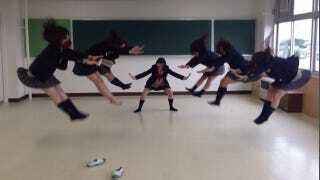 What looks like a Japanese manga come to life is really a bunch of schoolgirls having fun with friends. Or is it? Dun dun dun. These photos recently appeared on 2ch, Japan's largest bulletin board, under the heading, "Schoolgirls Nowadays lol". Others 2ch users uploaded photos that had been altered, giving the images a decidedly manga feel. "Schoolgirls now are manipulating chi?" asked one 2ch user. "Schoolgirls these days sure are scary," added another, while yet another summed it up, "They're masters of air." This seems like a thing, at least, with a handful of students. But it's not a national craze. Yet.